If you live in Lake Forest and have been thinking about writing your memoirs or life story but didn’t know how to begin, Milestones, the Gift of a Lifetime can help. Lake Forest residents spend considerable time and money securing their assets for future generations. Yet the most treasured gift you can give loved ones isn’t your wealth; it is the story about your life and family history. Your children and grandchildren deserve to know their family history. Everyone has a story to tell. Whether it is a family history, the tales of an entrepreneur or the desire to write your life story for those who follow, only you can tell it. In the relaxed setting of your Lake Forest home, Milestones, the Gift of a Lifetime (www.YOURMILESTONES.net) will preserve your own words into a professionally edited account of your life. Bonnie Bell, MSJ, M.Ed, principal of Milestones, the Gift of a Lifetime, is a published journalist with broad experience in writing memoirs and biographies. Skilled in the art of interviewing, she was a correspondent for People Magazine for more than 20 years. She has written for such publications as Crain’s Chicago Business, and formerly Newsweek and Business Week. 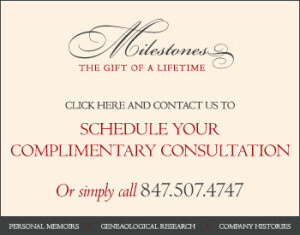 Find out more about Milestones, the Gift of a Lifetime providing personal history and memoir writing services in Lake Forest, IL 60045.